Remote but accessible, Sol Duc Hot Springs Resort is a wonderful place to get away from it all, relax, and enjoy spectacular nature. You can spend the day hiking through scenic lowland forest, past waterfalls, river, and lakes, and then return to the comfort of your cabin for a shower, a soak in a mineral pool, and dinner at The Springs Restaurant. Spend the evening relaxing on your cabin's front porch or playing cards with friends and family before repeating it all again the next day. With no televisions or telephones to interrupt your getaway, you'll be able to savor every minute of your vacation. Sol Duc Hot Springs Resort is located in the northwestern section of Olympic National Park, in the Sol Duc River Valley. Sol Duc Hot Springs Road, which leads to the resort, connects to Highway 101 near Lake Crescent (28 miles west of Port Angeles). Once you turn off of Highway 101 onto Sol Duc Hot Springs Road, proceed south for approximately 12 miles. When you can smell the sulfur of the hot springs, you'll know you're close! Sol Duc Hot Springs Resort's 32 cabins, while modest, are clean and comfortable. Non-kitchen cabins - these basic cabins include two beds, a separate bathroom, and a small seating area. Kitchen cabins - these duplex cabins have fully-equipped kitchens, two beds, and private baths. The River Suite - located in the second story of a building by the river, this suite includes three bedrooms, two bathrooms, two living areas, a kitchen, a dining area, and a spacious deck. 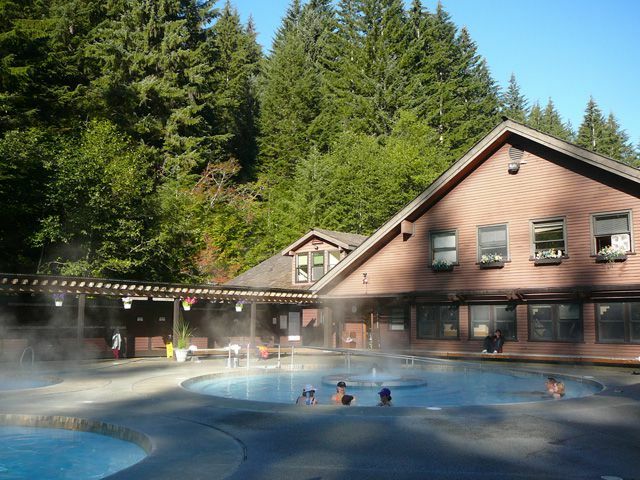 In addition to cabin accommodations, Sol Duc Hot Springs Resort offers 17 RV sites with water and electrical hookups. Located in the main resort building, The Springs Restaurant serves an adequate buffet breakfast and a more appetizing dinner. The dinner menu includes burgers, chicken, pasta, and seafood. Lunch, including items packed to take on a hike, can be had at The Poolside Deli. Coffee drinks are available at Sol Duc's Espresso Hut. Snack foods, cold drinks, and a limited variety of grocery items are available at the resort store. Sol Duc Hot Springs Resort can accommodate weddings, reunions, and other group events. Call 866-476-5382 to discuss your specific needs. While at Sol Duc Hot Springs Resort you'll be able to access all the beauty and activities available in Olympic National Park and on the Olympic Peninsula. Here are some of the activities you'll enjoy in the immediate Sol Duc area. Salmon Cascades - you'll pass the cascades as you drive to and from the resort on Sol Duc Hot Springs Road. Pets are allowed in some of the cabins. As is common in the travel industry, the writer was provided with discounted accommodations for the purpose of reviewing those services. While it has not influenced this review, TripSavvy.com believes in full disclosure of all potential conflicts of interest. For more information, see our ethics policy.